Happy New Year everyone! 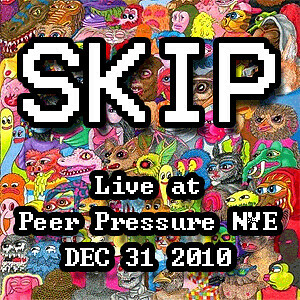 Now that we've all (hopefully) recovered from massive hangovers and are getting back into the swing of things, here is a recording of Skip's 45 minute live set at Peer Pressure - New Year's Eve to bring it all back. All tracks are original Skip tunes and cover his wide variety of styles including chiptune, drill'n'bass, IDM, and a hint of acid. Overall it's a great, upbeat listen and I can imagine it was a fun time in Belgium that night.